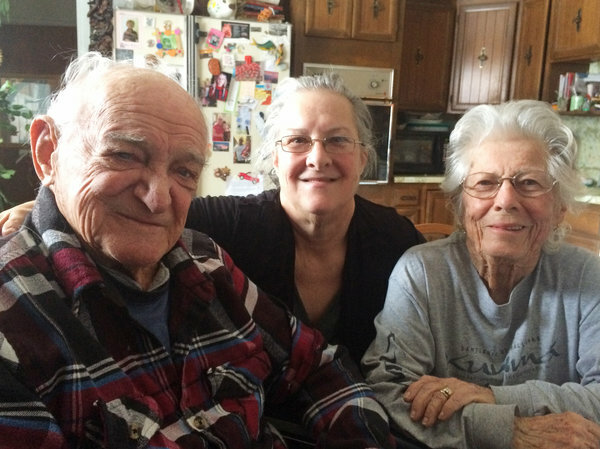 Bob Ebeling with his daughter Kathy and his wife, Darlene. Bob Ebeling spent a third of his life consumed with guilt about the explosion of the space shuttle Challenger. But at the end of his life, his family says, he was finally able to find peace. Ebeling died Monday at age 89 at in Brigham City, Utah, after a long illness, according to his daughter Kathy Ebeling. Hundreds of NPR readers and listeners helped Ebeling overcome persistent guilt in the weeks before his death. They sent supportive e-mails and letters after the January story marking the 30th anniversary of the Challenger tragedy. Ebeling was one of five booster rocket engineers at NASA contractor Morton Thiokol who tried to stop the 1986 Challenger launch. They worried that cold temperatures overnight — the forecast said 18 degrees — would stiffen the rubber o-ring seals that prevent burning rocket fuel from leaking out of booster joints. “We all knew if the seals failed, the shuttle would blow up,” said engineer Roger Boisjoly in a 1986 interview with NPR’s Daniel Zwerdling. Ebeling was the first to sound the alarm the morning before the Challenger launch. He called his boss, Allan McDonald, who was Thiokol’s representative at the Kennedy Space Center in Florida. McDonald phoned Ebeling recently after hearing the NPR story. Three decades ago, McDonald organized a teleconference with NASA officials, Thiokol executives and the worried engineers. Ebeling helped assemble the data that demonstrated the risk. Boisjoly argued for a launch delay. At first, the Thiokol executives agreed and said they wouldn’t approve the launch. Despite hours of argument and reams of data, the Thiokol executives relented. McDonald says the data was absolutely clear but politics and pressure interfered. Ebeling blamed himself for failing to convince Thiokol executives and NASA to wait for warmer weather. The morning of the launch, a distraught Ebeling drove to Thiokol’s remote Utah complex with his daughter. Three weeks later, I sat with Ebeling at his kitchen table, tears and anger punctuating his words. He didn’t want to be recorded or named at the time. Both he and Boisjoly, who died in 2012, became NPR’s anonymous sources in the first detailed account of the effort to keep Challenger grounded. Ebeling retired soon after the Challenger disaster. He used his engineering expertise and what he proudly called his love of ducks to help restore a bird refuge near his home, which was damaged by floodwater from the Great Salt Lake. In 1990, President George H. W. Bush presented Ebeling with the Theodore Roosevelt Conservation Award. Ebeling continued to volunteer at the refuge for 22 years and was named the Volunteer of the Year for the National Wildlife Refuge system in 2013. But that work didn’t diminish lingering pain and guilt. God “picked a loser,” Ebeling said in January, thinking back to his role in the Challenger launch. Then Ebeling heard from hundreds of NPR readers and listeners, who responded to the January story. “God didn’t pick a loser. He picked Bob Ebeling,” said Jim Sides, a utilities engineer in North Carolina. Ebeling also heard from two of the people who had overruled the engineers back in 1986. Former Thiokol executive Robert Lund and former NASA official George Hardy told him that Challenger was not his burden to bear. The burden began to lift even as Ebeling’s health declined. A few weeks before his death, he thanked those who reached out to him. Bob Ebeling is survived by his wife Darlene and 35 descendants spanning four generations, including a grandson studying engineering and granddaughter Ivy Lippard. Lippard joined NPR readers and listeners in posting a message about her grandfather on the website. What a wonderful post, Beth. That touched me deeply. So glad that he found peace. I can barely imagine what he went through after this tragedy. That is right. But the burden is so big and it is wonderful that he could find peace at all. Heartbreaking that he found peace such a short time before he died but thank heaven he did. yes, it was. his peace came at last, and he died weeks later. maybe he finally was able to go in peace. Wow! Thank you so much for sharing, Beth. I’d hate to have missed this. Wow what a story. Thankfully he died at peace but his guilt must have been awful. What Ryan said. I’m especially happy for Ebling that NASA reps added their voices. Yes, too long. I don’t honestly know if I could bear that. I remember reading this and feeling so bad for this gentleman, loving all this time with the guilt associated with that explosion. Even if it came late, I’m glad he found some peace. me too, george. i just wish it had come much earlier. What a wonderful story,Beth. Thanks so much for sharing. I don’t think I realized all of this before, thank you for sharing his story again. I am glad he was able to find that peace before passing and was able to let others know that he had as well. i had no idea either and was happy that he forgave himself at the end. Thank you so much for sharing this story, Beth. It breaks my heart to know that he thought of himself as a failure. A little overcome here by this post. Thank you for sharing it here. it is a really tough story, after reading how it affected the rest of his life. Thank you for sharing this story. Very touching. That poor man. What a burden to live with, when he did the right thing. So moving. Morton Thiokol was based in Chicago and was a customer of the software company I worked for at the time. As luck would have it, they called and requested someone to come and help them the week after the Challenger disaster, and I got the job. It was like a child’s funeral in their offices, very quiet, very sad. They were good people, and didn’t deserve to be made out to be the bad guys, even if it had been their mistake, which it would appear it wasn’t. God bless Mr. Ebeling, a man who shouldered the responsibility even though it wasn’t his. what an interesting connection, john. i think it was hard on many people. What an unfair burden to bear all these years. Bless him. My father-in-law also worked on that project. After the explosion he was sent to collect what they could and try to piece together what happened, what piece failed, ect. It still haunts him, knowing that his team was part of the event that shook so many people’s lives. wow, it impacted so many. the collateral damage was immense. Beth, I have never heard his story. Thank you for sharing. I’m glad the world reached out to give him peace. RIP. I can’t imagine his heart. I’m so glad people reached out to him. No one is as an individual meant to be guilty of accidents.I feel bad for Mr. Eberling. Wow. Amazing. God bless and rest his soul.